Boek: "De Reconnectie - heel anderen, heel jezelf"
Volgens Deepak Chopra levert dit boek een ‘interessant en nieuw inzicht in de dynamiek van genezing’. De buitengewone genezingen die bij patiënten van Dr. Pearl worden waargenomen, trekken de aandacht in de hele wereld. De ‘nieuwe frequenties van genezing’ die door Pearl hier worden beschreven, overstijgen alles wat tot heden aan genezingstechnieken bekend is geworden. Volg Eric Pearl op zijn ontwikkelingstocht van regulier arts/chiropractor naar de verbazingwekkende ontdekking van deze nieuwe energie. Met buitengewoon veel humor en relativerend vermogen neemt hij afstand van onnodige rituelen rond genezing en komt hij tot de conclusie dat deze genezing een verbond is tussen patiënt, genezer en het Universum. Dit verbond noemt hij Reconnectie, om vooral aan te geven dat het gaat om het herstel van de band met Ons Hoger Zelf. Why are prominent doctors and medical researchers all over the world interested in the extraordinary healings reported by the patients of Eric Scott Pearl? What does it mean when these patients report the sudden disappearance of afflictions such as cancer, AIDS-related conditions, and cerebral palsy? And what does it mean when people who interact with Eric report a sudden ability to access this healing energy not just for themselves, but for others, too? What is this phenomenon? Well, you might have to reconsider everything you've read up until now about conventional healing. The "new" frequencies of healing described by Eric Pearl transcend "technique" entirely and bring you to levels beyond those previously accessible to anyone, anywhere. This book takes you on ric's journey from the discovery of his ability to heal, to his well deserved reputation as the instrument through which this process is being introduced to the world. But most importantly, The Reconnection reveals methods you can use to personally master these new healing frequencies. 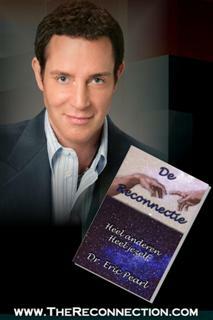 "De Reconnectie – heel anderen, heel jezelf"
"This book offers interesting and fresh insight into the dynamics of healing." "Eric is an amazing man with the superb gift of healing. Read this book and be transformed!" - John Edward, psychic medium; author of What If God Were the Sun? "This book is the truth - the truth about a revolutionary new way to heal and be healed that is available to anyone. . . . Eric Pearl tells the story of how he became transformed by reconnective energy, and how all of us can do the same. If you're serious about health and healing, read this book!" "As a physician and a neuro-scientist, I have been trained to know why and how a treatment works. When it comes to Reconnective Healing, I don't know how it works. I simply know from personal experience that it does. Eric Pearl's work has been a great gift for me, and through this book, can be the same for you." "Many have been waiting decades for what Eric Pearl has given us in his first book-a new, unique, and elegant way of teaching healing and transformation. The true revelation of his work, however, is that he is giving the secrets away! This intently funny and curious healer really shows the ease in which true energy healing can be recognized and activated within all of us. It's about time!" "Eric Pearl's The Reconnection is quite simply the best book on transpersonal healing and spirit medicine to appear in years. It is a gift from the Universe and an extraordinarily exciting contribution to the worldwide paradigm shift occurring in our time. If you read only two books this year, make sure that this jewel is one of them." "Eric has written a wonderful, thought-provoking, and practical book on healing. He shares not only his personal insights and experiences with the grace of healing, he also gives useful techniques to bring about the healings we all need in our lives - not only for ourselves, but for others. Eric's humor and sincerity make this book a MUST-READ."